Absolute momentum is a key factor in my latest momentum paper. 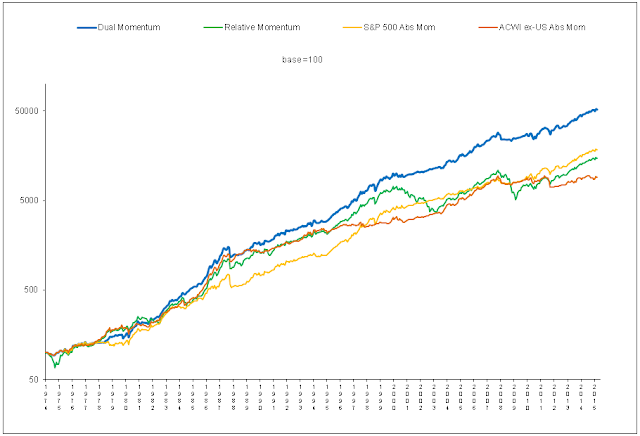 Positive absolute momentum exists when an asset shows a positive excess return over the look back period. Others call this time series momentum. 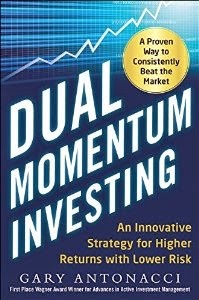 The more common momentum approach, which appears in most research papers, is relative (or cross sectional) momentum, where one asset is compared to its peers, and you select the strongest. Based on my research, relative strength momentum and time series momentum make for a great combination. In September of last year, Moskowitz et al. wrote a detailed working paper on time series momentum. Since then, there have been several other working papers dealing with time series momentum. One of the more interesting ones appeared on SSRN earlier this month. It is called Improving Time Series Strategies: The Role of Trading Signals and Volatility Estimators, by Akindynos-Nikolaos Baltas and Robert Kosowski. In it, the authors look at the implications of trading signals and volatility estimators on the profitability of monthly time series momentum strategies. Last December, the authors issued a paper called Momentum Strategies in Futures Markets and Trend-Following Funds in which they looked at time series momentum patterns cross monthly, weekly, and daily frequencies for commodity contracts.. The authors went on to compare various ways of identifying time series momentum. These included whether an asset has been up or down over the look back period, a moving average trend identifier, and several methods based on the t statistic of the regression slope. The most complicated method looked at 30 minute time periods and daily data in order to add an R squared cut-off filter. Based on the Ziemba Sharpe ratio, this method looked attractive. However, it also had the highest volatility. Looking at the performance chart of all the methods, the simple up/down method seemed to be the most consistent. I found one of the most interesting parts of their paper to be the exploration and comparison of different volatility estimators. These could be useful for risk parity style asset allocations, which I may address in another post.